Happy Monday, friends! I hope you all had a great weekend and are ready for another really exciting week filled with opportunity. 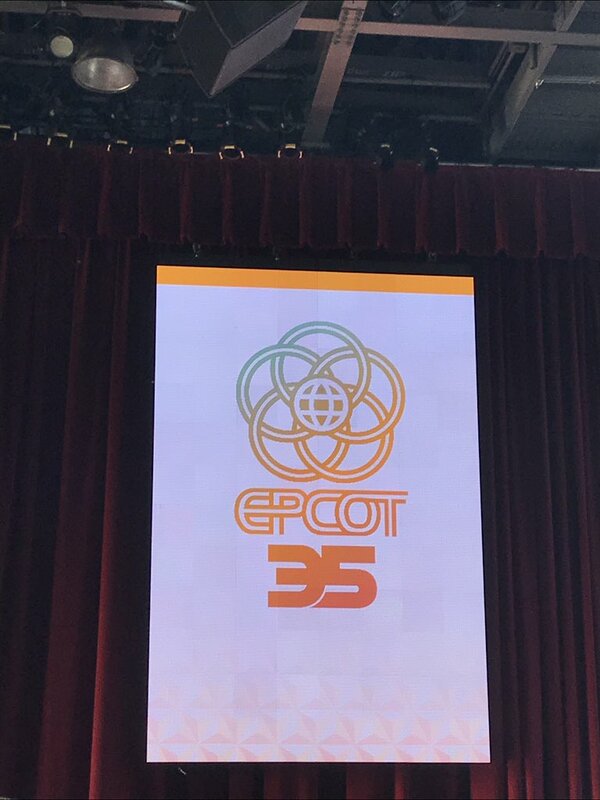 Today I want to share with you guys what it was like at the Epcot 35th Anniversary Celebration about a week ago. My mom and I drove down to Epcot early Sunday morning and were there right as the park was opening and we were both handed one of these commemorative maps and buttons. I love collecting stuff like this, so I was super excited they were handing these out. So we quickly found a spot to watch the ceremony that was going to be happening at the Fountain of Nations. While we were standing there it started to rain even harder, so we stayed under one of the two side booths that sell Festival merchandise walking from Future World into World Showcase. That's where we met three really fun Disney College Program students, and honestly they were some of the funniest people I've ever met, so if you guys are reading this, thanks for hanging out with us for a while! The ceremony was led off by the mariachi band that plays in the Mexico pavilion, then the Vice President of Epcot, the President of Walt Disney World, then the Voices of Liberty from the America pavilion. Hearing the ideas and dreams for the future of Epcot is so exciting and I know this park is going to be more of Walt would have wanted, and somewhere that more people are going to want to explore in the future. We tasted our way around the world at Food and Wine Festival, but that post is coming in a few days. The last part of our day was spent watching Illuminations: Reflections of Earth, because they added in a special ending for Epcot's 35th Anniversary! I've never seen Illuminations with one of the special endings and honestly, I was so glad we stayed at the park so late for it! Friends, if you haven't ever been to an anniversary day at a Disney park yet, you have to get to one! The next major one is next year for Animal Kingdom, celebrating 20 years! Let me know in the comments if you've ever been to an anniversary celebration! Also, be sure to follow me on Instagram for more Disney fun and adventures!